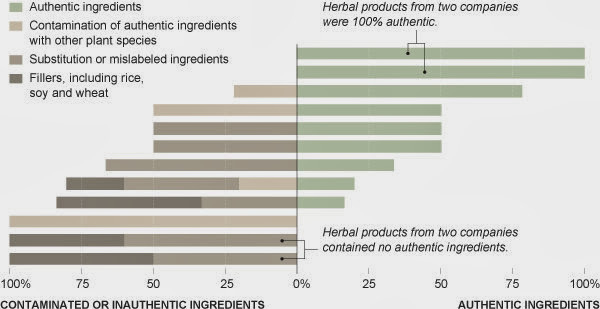 with the percentages of ingredients in their respective products that were and were not authentic. 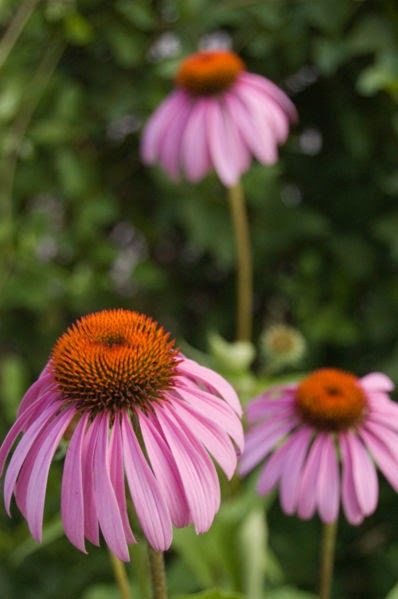 For example, sample bottles of echinacea supplements, which millions use to prevent and treat colds, contained Parthenium hysterophorus, an invasive weedy plant that can cause dermatitis and breathing problems in people and livestock. So you might prevent a cold, but end up with a bad rash? 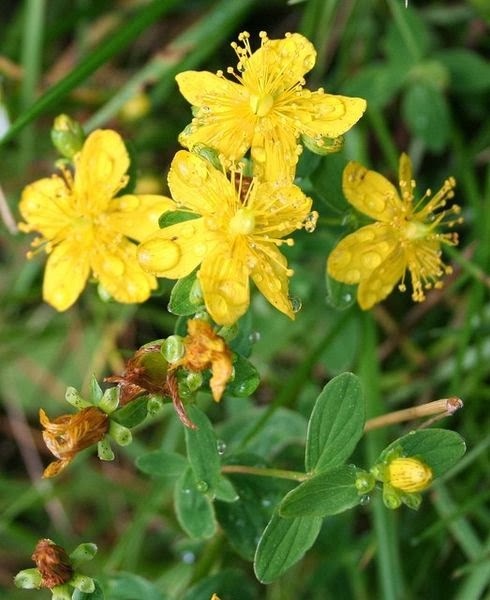 The two samples of St. John's wort, used most commonly to treat depression and related anxiety, contained no St. John's wort at all. One contained only rice, and the other contained an Egyptian shrub called Alexandrian senna, which happens to be a laxative with bad long-term side effects. Now that is depressing. Gingko biloba supplements, taken to enhance memory, were found to contain fillers, as well as black walnut DNA, which could potentially trigger nut allergy symptoms. 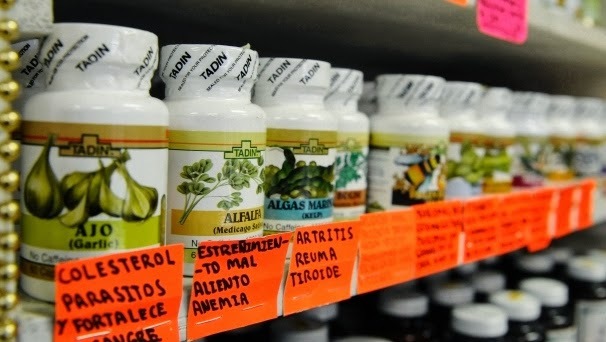 The supplements were supposedly single-ingredient products, so the researchers expected to find the genetic code of just one plant species in each. While 48% of the products they tested did contain the key ingredient, about 1/3 of these, and 59% of all 44 tested products, contained other plant species that were not listed on the label. Oops. These would be fillers or contaminants. Products from just 2 of the 12 companies were the genuine article - no substitutions, contaminants, fillers, or mislabeling - while the products of 3 companies completely lacked the main ingredient on the label. So how did the scientists determine all this? The research team asked: (1) whether the herb on the product label was, in fact, found in the bottle; (2) whether that herb was the main ingredient (or did something else make up the bulk of the sample); and (3) whether "filler" ingredients (e.g. rice) were used but not on the label. Genetic barcoding works in the same way a supermarket scanner distinguishes products using the black and white stripes of the UPC barcode of your purchases. 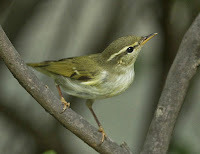 Two items may look very similar, but may have subtle distinctions that are reflected in their genetic makeup, so their respective barcodes would be distinct. Scientists use a particular gene region called CO1 to barcode almost all animal groups because each species has a different sequence of the 4 components of DNA. For plants, they use 2 different gene regions, but for the same reason. To create a barcode for a sample, researchers must first get their hands on a specimen of biological material, usually blood, tissue, or leaves (for plants) from places like museums, zoos, aquaria, or seed banks. In the laboratory, they can produce a small genetic sequence from the specimen (in this case, the specimens were the herbal supplement capsules). 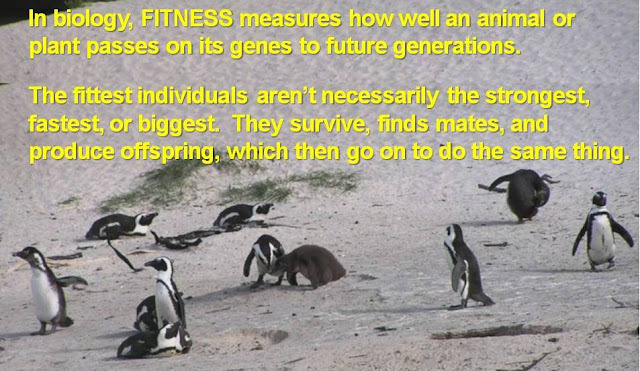 They then compare the sequence to a database of sequences of known animals or plants and find the closest matching record in the database. 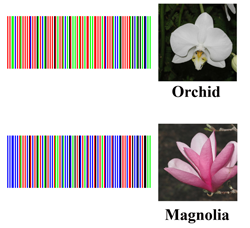 Here are the DNA barcodes for an orchid species and a magnolia species - they are quite different! DNA barcoding is also being used to help uncover fraud in food labeling (when the snapper you ordered is really tilapia or Vietnamese catfish) and monitor the trade in wildlife and plant products. More to come on those topics. For now, it's important for the millions of people worldwide that use natural remedies to maintain their health to remember that more than half of the herbal products tested in this study were guilty of product substitution, contamination, and/or use of filler material. Aside from potentially harming consumers from nut or other contaminant material, by diluting the effectiveness of supplements that might otherwise be helpful, these activities may lower the value of other herbal products because they destroy consumer confidence in them. On a good note, it IS possible to correctly produce each of these supplements: at least one company produced an authentic product for nearly all the herb species in the study. The regulation of herbal remedies has been called "the Wild West," and purchasing herbal supplements requires no prescription or advice from a health-care professional, so consumers should review their products carefully and, as much as possible, verify their authenticity. Newmaster, S., et al. 2013. DNA barcoding detects contamination and substitution in North American herbal products. BMC Medicine 2013, 11:222 doi:10.1186/1741-7015-11-222. Smart drugs always give you the smart body into them without getting the smart drugs you cannot be able to get the smart body. Only by getting the smart drugs form this summitgym.net/ website you will not face any side impact danger which will inquisitive for your health.